The Eastern Interior region, as defined by the USGS, is a region of a large number of coal mines along the southern border of Illinois, the western border of Indiana, and the western tip of Kentucky. In 2008, production in Indiana was 35.9 million tons (7th in the US, 3.06% of total US production), Illinois produced 32.9 million tons (8th in the US, 2.81% of total US production) and the western part of Kentucky produced 30.1 million tons. Kentucky as a whole produced 120.4 million tons and was behind only Wyoming and West Virginia in total production. Images from the 1970s documenting Scott Clark’s family’s relationship with strip mining in Western Kentucky and Southern Illinois. Click here to see photoset. Brian W. Mason, a 25 year old truck driver with 16 weeks of mining experience was killed at the Freelandville Underground Mine when he lost control of the articulated truck that he was driving, went up an embankment, then crossed the back across the road and over the berm, plunging 72 feet down into the mining pit. After the fall, the driver was pinned in the cab, stopping three witnesses to the accident from helping him. After 35 minutes, rescuers were able to extract him from the cab and he was transported by helicopter to a hospital in Indianapolis, where he later died from his injuries. While other drivers had reported that the truck involved in the accident would routinely require topping-off its brake fluid, the ultimate cause of the accident was determined to be the driver failing to maintain control of the vehicle. Web page by the US Energy Information Administration summarizing energy consumption, production and prices for the state of Kentucky. Web page by the US Energy Information Administration summarizing energy consumption, production and prices for the state of Indiana. Web page by the US Energy Information Administration summarizing energy consumption, production and prices for the state of Illinois. For several years, Roger Natte, a local Fort Dodge Historian has been researching and compiling information for a work he has prepared on Coal Mining in Webster County. In 2001 Roger Natte contributed a portion of his research that is subject to Coalville for the Coalville Web page, that information is contained here below. A very special thank you to Roger Natte for this wonderful amount of information he has made possible for the people of Webster County, and graciously provided to our Coalville, Iowa Web page. Award-winning journalist and cultural historian Jeff Biggers takes us on a journey into the secret history of coal mining in the American heartland. Set in the ruins of his family’s strip-mined homestead in the Shawnee National Forest in southern Illinois, Biggers delivers a deeply personal portrait of the largely overlooked human and environmental costs of our nation’s dirty energy policy over the past two centuries. Reckoning at Eagle Creek digs deep into the tangled roots of the coal industry beginning with the policies of Thomas Jefferson and Andrew Jackson. It chronicles the removal of Native Americans, and the hidden story of legally sanctioned black slavery in the land of Lincoln. It uncovers a century of regulatory negligence, vividly describing the epic mining wars for union recognition and workplace safety, and the devastating environmental consequences of industrial strip-mining. The Union Pacific railroad has detailed statistics and information about mines in its service region in southern Illinois. Another coal miner was killed on the job while working at the MC No.1 Mine in Franklin County, Illinois. 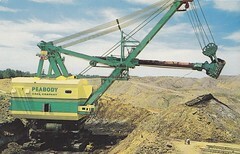 The incident happened on Wednesday when the coal miner became trapped between a machine and a coal rib at the Sugar Camp Energy complex. This is the second fatality at this complex in less than seven months and the sixth mine fatality in 2014 according to the Mine Safety and Health Administration (MSHA). A “trench warfare” is beginning in at least 18 state capitals across the country between industry groups looking to prevent further regulations looking to curb greenhouse gas emissions and a new and formidable opponent in the renewable-energy interest lobby. Companies such as Exxon Mobil, Koch Industries and major coal companies such as Duke Energy and Peabody energy are joining together in attempts to preempt the EPA’s power plant rules. Places such as Kansas, which have traditionally relied on fossil fuels as a key in economic stability, have recently become a battleground for wind proponents and renewable energy advocates. What were once bastions for coal interest lobbies and other fossil fuel advocates are now ripe battlegrounds for the clash of well-funded renewable energy and fossil fuel interest groups. After the devastating February 2nd spill that released toxic sludge for over 70 miles on the Dan River, Duke Energy is under pressure to remove all coal ash that borders North Carolina’s rivers and lakes. Environmental groups are citing the need for Duke Energy to remove all of their coal ash to lined landfills in order to avoid the environmental degradation that occurred on the Dan River. Duke Energy is alleging that this removal of coal ash would cost over $10 billion dollars and take decades to clean up. Furthermore, Duke Energy has stated that the majority of these costs for paying for coal ash clean up would come from its electricity customers. National Geographic discusses the argument that clean coal is nothing more than a myth. The article discusses the idea of capturing the CO₂ and how long can these deposits actually store the carbon dioxide. There is evidence from leading Geophysicists that often, the injection of the carbon dioxide is put into reservoirs with brittle rock. This leads to small earthquakes, which cause cracking in the overlying shale rock and leads to CO₂ leaking from the storage facilities. The National Institute for Occupational Safety and Health (NIOSH) recently identified an increase in black lung disease among Kentucky coal miners. In 1969, 40 percent of seasoned miners had black lung but with the passage of the 1969 mining act, the prevalence from 1995 to 1999 had dropped to 2 percent. However NIOSH recently reported that from 2005 to 2009, 9 percent of Eastern Kentucky miners had developed black lung. Some of the reasons being attributed are shifts of 10 to 12 hours in the mines; poorly designed dust control regulations; more cutting through rock in thinner coal seams; and the coal industry’s failure to follow these regulations to protect coal miner safety. Reports from MSHA Office of Accountability reviews of MSHA inspectors in region 8.